The Minis ~ Rock with laughter this season! Finally the most popular Rocknoggins are now available as minis. These little guys stand 3" to 4" tall, with the littlest, "Hombre", resting in at just under 2". "Cletus" (on the left) is the interactive "mood gauge" and can be changed from a simple smile to a full out belly laugh...and many variations in between. Feelin' a little surly ~ just give him a twist. Want to yuk it up ~ just rest your finger on his head and tap lightly!...and his mouth is hollowed out for a little extra storage (trinkets, coins, emotional baggage?). They're all great fun!! 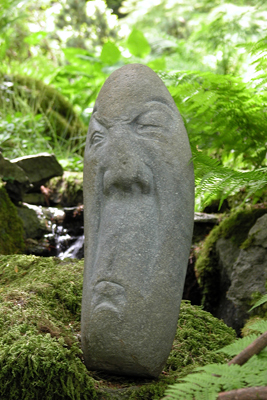 Rocknoggins are a whimsical way of expressing life, personalities and serendipity. 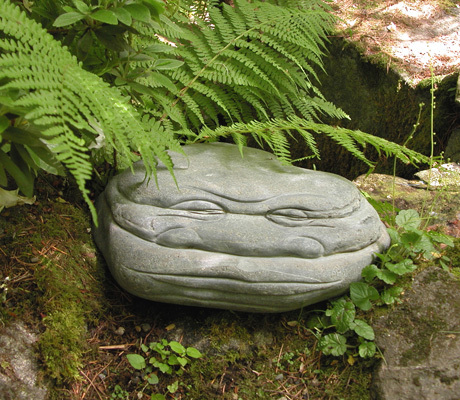 The rocks used to come from South Cascades, North Cascades, and the Rocky Mountains, each noggin has its own unique character discovered as faint images naturally hidden on its surface and released from the rock by the imagination and talent of artist Dawn Sorrell. "Good friends are like Rocks, they will last our lifetime and they are always around when you need them." Imagination and creativity go hand in hand. Like a child looking up to the sky and seeing images in the clouds. That's what Rocknoggins are — sheer unrestrained imagination — the truest form of creativity. I see faces in rocks! There is a process of discovery — the longer I look at a rock the more I see. I've always strived to portray some kind of emotion with my work — to impact people on a very personal level. What could be better than making people laugh? After recently moving to Washington and giving up a successful nine-year career as a graphic artist to sculpt full time — I began to feel the enormous stress and pressure that I think many people feel taking that kind of plunge. Consequently, I needed a creative outlet that I could express myself and try to free up my creative energy that had been lost. I began finding rocks on various hikes with faint images naturally hidden on their surface. I took them back to my studio and started refining these images and making them into what they are today. They were so spontaneous and liberating that I continued and slowly began to free up creatively. The joy in my life is apparent in this collection. During a rough period of time in my life, I felt confined and restrained and the titles of my work were, "Entangled", "Boxed-in", "Injured Soul", and such. Suddenly my life started shifting and my new pieces were entitled, "Liberation" and "Steppin-out". Now, I'm concentrating on "being' and living my life to the fullest. Rocknoggins express the sheer joy I have found in my life by taking a risk and following my dream. The Rocknoggins are a whimsical way of expressing life; playing on the characteristics and personalities of reality with added elements - imagination and creativity. "I really want to thank you for creating these noble beings and giving us all just a little clearer understanding of how much of all of us can be found in the next rock up the path." It's always been important that my work portray passion or excessive expression in some way. There is so much inside me that sometimes I feel like I'm going to burst trying to express all that I feel (all that is me). For years I have felt restrained and quieted and now I've been unleashed and it's just a matter of having enough time to express all that I have that's been bottled up for so long.